With all the talk of of EV’s and alternative fuel vehicles, much has been said about the forebears of these cars. 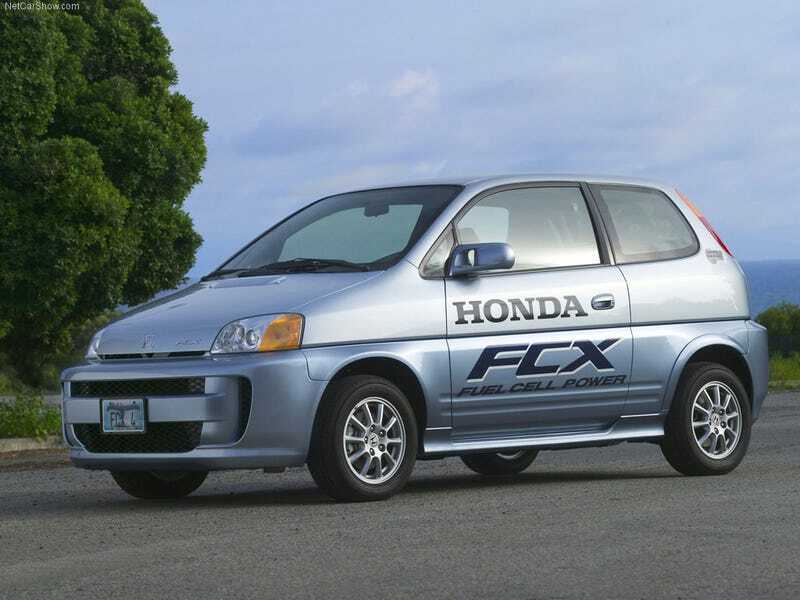 But you never hear much about the first gen Honda FCX. Most likley though this is because it only ever went to a few individuals/cities in the world. The original FCX and the Clarity we have today can actually trace their origins back to the above pictured concept car from the ‘99 Tokyo show. It had 80 hp and 201 lb/ft of torque and a reported EPA certified range of 170 miles, which is better than a lot of low range EV’s on the market today. At first, Honda only let companies and governments lease the vehicle.A lot of them went to cities here in California. But in 2005, they let the first private buyer get the vehicle, in, you guessed it, Southern California. Hell the car was the official pace car for the LA marathon from ‘01-’07. The car itself was typical Honda, but advanced: boring but functional. It was a 3 door hatch back with 107 horses and 201 lb/ft of torque, like the concept. It even had more range than the concept, being pegged at 190 miles. The fuel cell itself was designed in house by Honda. It received incremental software upgrades to its drivetrain as well, that gradually increased in the range to 210 miles in 2006. Inside it was typical Honda as well, and at first glance could be a mid ‘00's Civic. Boring but clean and functional, like the car itself. It had all the creature comforts you’d expect as well like ac, cruise control, power windows etc and could supposedly seat 4 adults. Not much is known about how it drove. I found one thing that said it had a 0-60 time of about 11 seconds and a top speed of 94. And you cant even really find news about a debut or anything from my research. Its almost like no one drove it or the world forgot it existed. I didn’t though. I actually saw one today on the back of a tow truck being towed to who knows where. But never forget that many of these alternative vehicles around today owe their existence to vehicles like the FCX who pushed the boundaries early, even though not many people got to experience it.